Learn how to make 11 amazing tissue paper decorations. DIY decorations are always good for the party budget, and tissue paper makes an awesome backdrop, pom poms and garlands. Suitable for all color schemes these DIY tutorials will get your creative juices flowing. They are all easy to make and great for all kinds of parties from a birthday celebration to baby showers. No: 11 is going to look amazing! There are so many decorations that you can purchase for parties it can sometimes feel overwhelming knowing where to start. The other problem is that whilst they may initially seem cheap, the cost of them quickly add’s up when you are purchasing several. What you initially thought was going to cost you $5, costs $50 once you have bought everything you need. The easy way to reduce costs when decorating for parties, is to do a bit of DIY. This can also seem daunting, I get that. But it doesn’t have to be as daunting as you think, and it will save you a bucket load of cash. All these tissue paper decorations are cheap as chips to make and they can all be tailored to the theme of your party simply by changing up the colors. Yes they will take you a little bit of time to do, but they can easily be done from the couch whilst watching your favorite show. You have nothing to loose by giving them a try! This tissue paper garland is super easy to make and is going to cost you next to nothing to create other than a bit of your time. Garlands are a great way to provide a splash of color in party decoration and can be used for pretty much any theme. You don’t even need any glue or tape to make them, so they are completely mess free. I absolutely love garland’s and this tissue paper garland by “Lemon Thistle” is adorable. It’s super simple to make, super cheap but has an amazing impact. That’s got to be a winner for one of the best tissue paper decorations don’t you think? You will see a lot of these flower garlands being sold on Etsy, but the great thing is that they are super simple for you to make by yourself. Ok, you will need a little bit of patience to complete the project, but it’s a great thing to do whilst sitting in front of the tv at night. “Jam Blog” will walk you through the entire process so that you can make one of these tissue paper flower garlands for your next party. Just dig out your needle and string in preparation. I love this super pretty accordion bunting by “A Subtle Revelry”. All you need is the tissue paper, some glue and a bit of string. It’s super simple, but super effective too. Tissue paper pom poms are always a party favorite and they are being sold everywhere in the party stores. They are probably one of the most well known type of tissue paper decorations around. However, if you have a bit if time and you would like to save a bit of cash, then making them is a much better idea. It’s really not hard and once you have made one, you will find yourself in free flowing pom pom mood. These tissue paper flower fans by “Domestic Fashionista” are a great way to decorate a party backdrop, or brighten up a dull wall. With a little bit of glue, some folding and some patience, it is easy to recreate a stunning display of fans like this. This is a great example of how tissue paper decorations can make a maximum impact with very little effort. These tissue paper flowers by “Uncommon Designs Online” are absolutely stunning and have got to be one of the most beautiful tissue paper party decor you will find. You will need your tissue paper, scotch tape, floral wire and poster board and then some time to get crafty. Perhaps you prefer the look of these giant tissue paper flowers with stems? This would make a fantastic photo prop! Let “Darice Craft Blog” show you how it’s done. Believe it or not, but these geometric lanterns are made out of tissue paper. They make an eye catching display and all you need to recreate them is tissue paper, double sided sticky tape, scissors, a needle and a fishing line. “Oh Happy Day” provides an easy step by step tutorial to help you make these for your next celebration. This really is tissue paper decorations showcased at their finest! Something that all kids would love to see at their party is a huge decorated birthday number. “The Bajan Texan” provides a tutorial that everyone can easily follow. This birthday number sign will provide that pop of color that you need, plus remind everyone how old the birthday boy or girl is turning. Grab yourself a foam board, a sharp knife and of course the tissue paper color of choice. It’s always great to have a backdrop at parties. Whether you choose to use them behind the food table, or as a photo backdrop, they are always great as a party feature. 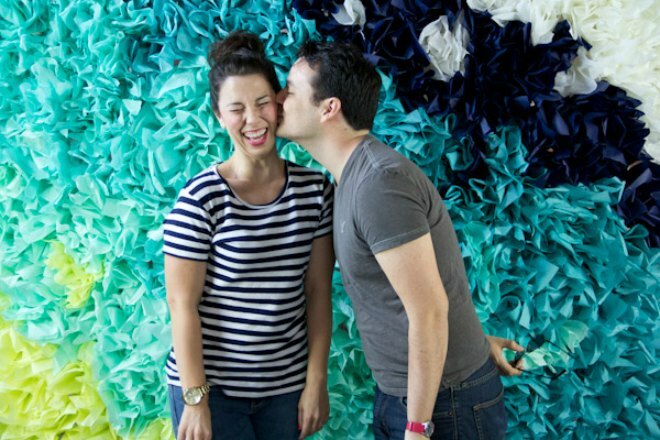 This tissue paper backdrop by “Lovely Indeed”, will take you a bit of time to create, but the end result is absolutely stunning. Who would have thought that you could make a bit of chicken wire look so appealing! Now that you have been armed with 11 cheap DIY tissue paper decorations, the question is which one are you going to tackle first? Why not try combining a few of them together to really make a statement. When the decorations look this good at such a cheap price, you might as well have some fun and get creative. I’d love to hear what you try and how it turns out. Let’s stay in touch. Love the easy party decorations projects? Sign up to the newsletter so that you never miss a thing.